Background: The high levels of blood alcohol achieved with chronic plus binge alcohol exposures are somewhat reduced by co-administration of tobacco-specific Nicotine-Derived Nitrosamine Ketone (NNK) suggesting that NNK may alter alcohol metabolism. 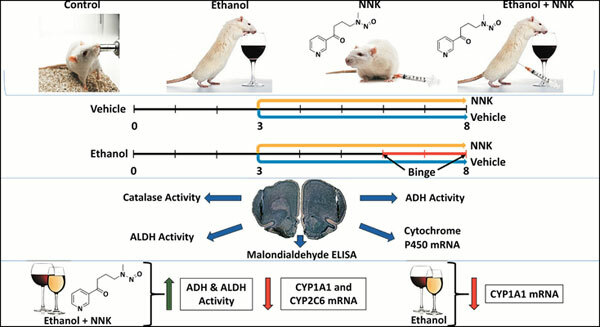 Objective: We examined ethanol and acetaldehyde-metabolizing enzyme activities and malondialdehyde adduct formation in rats exposed to ethanol (chronic + binge), NNK, or both. Methods: 4-week old Long Evans rats were fed liquid diets containing 0% or 26% caloric ethanol for 8 weeks. Ethanol-fed rats were binge-administered ethanol (2 g/kg; on Mondays, Wednesdays, and Fridays) by intraperitoneal (i.p.) injection, while control group administered saline in weeks 7 and 8 (n=12/group). Six rats from each group were administered i.p. injections of NNK (2 mg/kg) or saline on Tuesdays, Thursdays, and Saturdays of weeks 3 through 8. Alcohol dehydrogenase, catalase, and aldehyde dehydrogenase activities were measured using commercial assays. Cytochrome P450 mRNA levels (17 isoforms) were measured by quantitative reverse transcription-polymerase chain reaction. Malondialdehyde immunoreactivity was measured by enzyme-linked immunosorbent assay. Results: Dual exposures to ethanol and NNK significantly increased frontal lobe ADH activity relative to control (P=0.01) and ethanol only (P=0.04) treatments, and ALDH relative to control (P=0.02). In contrast, malondialdehyde-protein expression was not significantly altered by ethanol+NNK. Ethanol decreased CYP1A1 mRNA expression relative to control (P=0.02), and combined ethanol+NNK exposures decreased the expression of CYP1A1 (P=0.01) and CYP2C6 (P=0.03). Conclusion: Dual exposures to ethanol and NNK increase brain ethanol metabolism and inhibit the expression of CYP450s that regulate xenobiotic metabolism. Ethanol metabolism, alcohol dehydrogenase, aldehyde dehydrogenase, catalase, cytochrome p450, malondialdehyde.